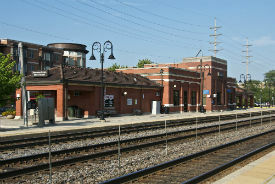 On April 16, 2014, construction workers will begin fencing off the west ends of both the inbound and outbound platforms of the Main Street Train Station in preparation of work to begin to replace the concrete platforms. The work on this part of the platform is projected to take two to three months. Once the western portions of the platforms are completed, the east ends of each platform will be closed off and work will begin to replace them. The work planned for the east end will also include the construction of a pedestrian diversion on the east end of each platform at Washington Street. This METRA project will replace the concrete platform at the Main Street Station. Work will involve breaking up the old layers of concrete with a jackhammer, hauling them away, and replacing the platform with new concrete.